An artist’s impression of the Sapphire development on the Kingston Foreshore. File photos. A revised development application for the planned Sapphire development on the Kingston Lakefront has attracted a flurry of comments from neighbours upset at plans for a public carpark. The parking report in the DA, which is essentially the same as the one approved in April apart from minor modifications, refers to a 10-space public carpark in the landscaped area on the eastern side of the complex which is available to the general public and not allocated to nearby unit developments as part of visitor parking. 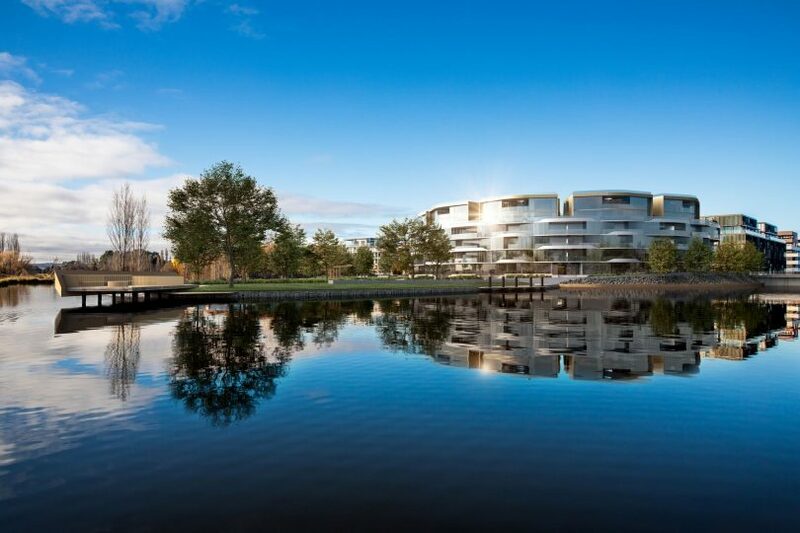 Canberra developer Keggins is behind the 79-apartment complex, which is the last lakefront development in Kingston. Residents are concerned that the carpark would diminish their views of the lake, spoil the aesthetics of the waterfront and set an undesirable precedent. One person whose new apartment is directly across from the carpark on Honeysett View says there has not been any consultation. “I assume this carpark is for people to use when they visit the tiny park which is yet to be created at the foreshore creek. Could it not be better placed at the Causeway end of Honeysett View where it will not upset any of the residents of Peninsula, Northshore, or any other residential development? There is a huge tract of land there which is currently unused,” the comment says. This landscape illustration from the DA shows the car park to the right of the Sapphire development. Another says that as a local resident they have observed that, overwhelmingly, car spaces are used by residents of the apartment buildings. Another says the location of the planned car park is shortsighted and that it should be moved to the end of Honeysett View where there is vacant land adjacent to the Causeway. “The proposed site is not suitable from an aesthetic perspective and will appear out of place,” the comment says. Another objector insists that the people who enjoy the waterfront adjacent to the Sapphire complex and along the wetlands do not need a carpark. “They are part of a larger community that value the simple pleasures of nature, of walking amongst the sounds and sights of unique protected wildlife and the quiet relief from traffic. According to the DA, the urban open space area to be constructed will be handed back to the Territory. Keggins purchased the 3697 square-metre waterfront block on the peninsula in June 2016 for $21.65 million. I live at the foreshore, not at the location in question, my views won’t be affected for better or worse but I firmly believe that the more “green space” we have in light of the concrete/metal lego land we currently have at the foreshore is for the greater good. 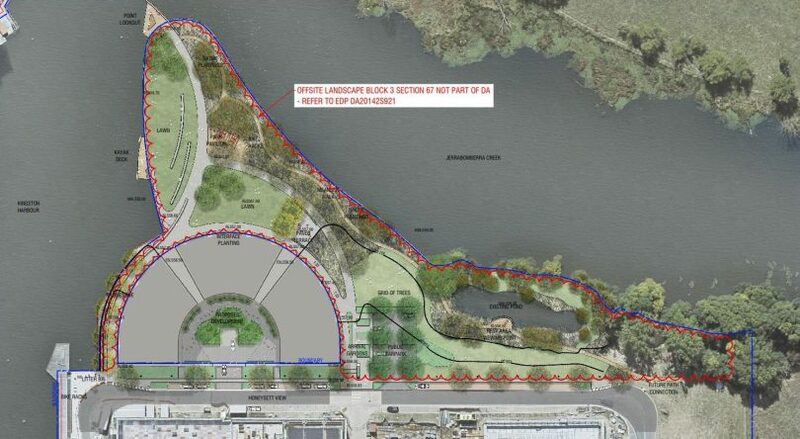 Leave ANY current green space along the foreshore alone. The “Pooch” has already been screwed with the substandard and preferential planning, construction that has occurred here in the “heat sink” that is the Kingston foreshore. The best we can do now is try and make the place more liveable and fight tooth and nail for every square inch of grassed area on or near the waters edge. Prior to selling more back blocks for development the govt should put aside area for multilevel car parks (Share use – Business/owners/public) with shops/accomodation above the carparks. As an example – The future of the large carpark area’s at markets/glassworks/brodburger need to have several levels to cater for new business, current businesses and current as well as FUTURE increased visitations to the foreshore as a lot of the parking spaces are taken up by employee’s of venues along main front (Cafes etc). Anyway, back to the main point – the proposed 10 car spaces MAY have a use and need to be created but not on waterfront parkland. Waterfront parkland IS TOO VALUABLE as a community asset now as we’ve already shoved stones/concrete/metal/bitumen everywhere else. We need to actually be reclaiming space for tree’s and bushes here not giving away space for more bitumen and concrete. Smart people with smarter environmental planning skills would help but I know I’m flogging a dead horse there. Existing developments should already have considered this as part of their initial planning. CARPARK can go elsewhere thanks. They are cars parked on both sides of the road anyway, so cars are visible. We live directly behind the new development, and are not concerned about cars. Worried about the view. How ugly are all their million dollar apartments that ruin our view of the lake. Undesired precedent? What, cars parking legally? How could 10 parking spaces spoil a view? Are they living in a basement? Don't want to spoil the aesthetics of the lake but happy to live in a postmodern, generic apartment block that completely spoils the aesthetics of the lake.